The black d:screet 4062 Omnidirectional Microphone, XLo-Sens with Microdot, Accessories and 3.5mm Adapter from DPA offers a clean, detailed, and natural sound quality and the extra-low sensitivity capsule can handle SPLs of up to 154 dB. It is designed for use with wireless systems and can be utilized for theater, television, and close-miked instrument applications. The d:screet 4062 microphone is highly unobtrusive. Because of its small size, it delivers an accurate omnidirectional pattern and does not need to be aimed directly at the sound source to achieve quality pickup. Also, the d:screet 4062 omnidirectional microphone includes a cable clip, concealer and mounting tape, windscreen, soft-boost miniature grid, and a high-boost miniature grid. 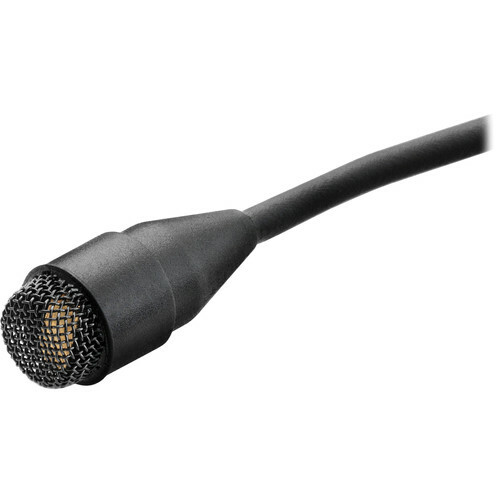 The cable terminates to a microdot connector with a 3.5mm adapter for direct connection to a Sennheiser Evolution bodypack transmitter. For a Sennheiser Evolution bodypack transmitter.